the search for up to 13 others missing murals by the artist. 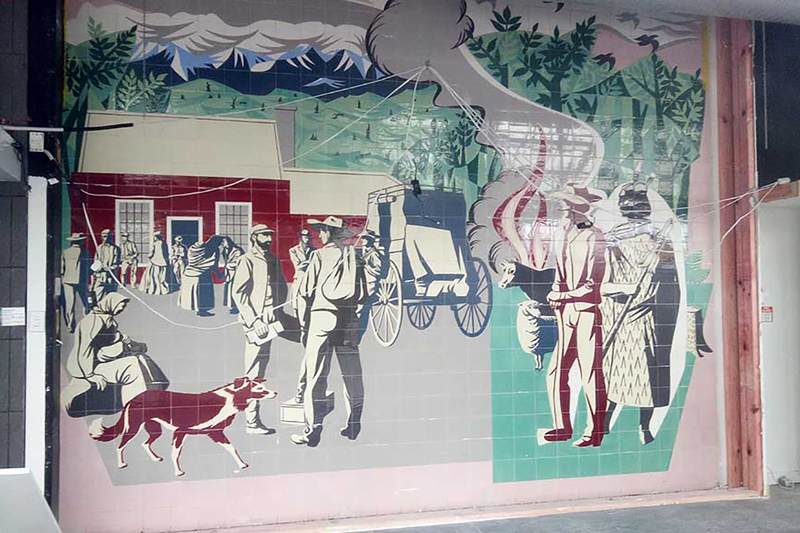 A Massey University researcher's quest to preserve the work of artist and craftsman E. Mervyn Taylor reaches another milestone this week when a recently-revealed mural, at the site of the former Masterton Post Office, will be the focus of a talk and walking tour. 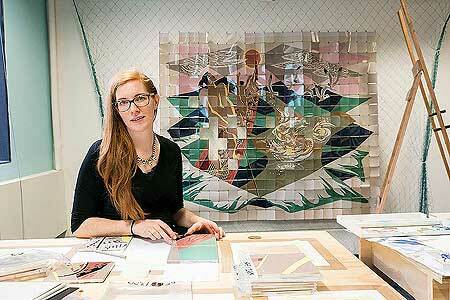 The artist created two ceramic tile murals that capture significant moments in Masterton’s and New Zealand’s history. They include the mural Lest We Forget in the Masterton War Memorial Stadium Hall of Memories to commemorate the two world wars, and a work entitled Early Settlers that once decorated the outer entry to the post office. The post office building was sold into private ownership in the 1980s and the mural was subsequently enclosed in the ground floor of the building and secreted behind a wall in a retail space in 2009. After many years, the building has been sold to a new owner, Masterton developer Trevor Pearce, who is strengthening and refurbishing the building, and has removed the wall concealing the mural, returning it to public display. PhD candidate Bronwyn Holloway-Smith, who was director of the E. Mervyn Taylor Mural Search and Recovery Project at Massey University’s College of Creative Arts, will be giving a talk at the Aratoi Wairarapa Museum of Art on Saturday July 14. She will also lead a guided tour of the two Masterton murals accompanied by archivist and local historian Gareth Winter, who will speak about the war memorial mural. Mr Winter has written about that mural for Ms Holloway-Smith’s book Wanted: The Search for the Modernist Murals of E Mervyn Taylor, which was published by Massey University Press in March. She expressed excitement that the previously hidden work, which was protected and unable to be moved without a notified consent, will now be back on public display. The search for the missing mural and 11 others created by Taylor between 1956 to 1964, was inspired by the discovery of one of his surviving murals, Te Ika-Māui, the story of Māui fishing up the North Island, stored in cardboard boxes in a disused cable landing station. Ms Holloway-Smith (an artist herself) made the discovery in 2014 when she was researching the history of the Southern Cross Cable, New Zealand’s primary internet connection to the world, as part of a commission she was completing with Wellington-based public art commissioning group Letting Space and the marketing firm JWT in Auckland.Since then she has led efforts to meticulously clean and digitise the work through her project, Te Ika-a-Akoranga, and subsequently made colour-matched, full-scale gouache paintings to fill the gaps left by sixteen missing tiles. E. Mervyn Taylor, who studied at Wellington Polytechnic, a forerunner of the College, also used carved wood panels, sand blasted windows and paint to create his distinctive works made at the end of his career.“His work provides us with a fresh perspective on New Zealand history that hasn’t necessarily been protected but is essential in ensuring a more accurate understanding of what we represent as a nation,” Ms Holloway-Smith says.